In 2008, in order to determine the distribution and abundance of leaf litter amphibian species, I began a monitoring program around the Piro Research Center along with Federico Bolaños and Gerardo Chaves, herpetologists from the University of Costa Rica. In 2010, with the support of the Mohamed bin Zayed Species Conservation Fund (MBZ), I expanded this project to Los Charcos and Petosa, a private property owned by Bert Kerstetter, an important supporter of Friends of the Osa. The information generated by this project was included in the latest update workshop of the conservation status of amphibians in Costa Rica for the IUCN Red List, held in San Jose in July this year. The workshop was organized by the University of Costa Rica’s School of Biology and the Conservation Breeding Specialist Group (CBSG) of the Species Survival Commission of the IUCN. The workshop summary will soon be published by the organizers, and we’ll share that report through the blog. As part of this project, and with some good luck, we’ve observed many interesting species of amphibians. One species in particular which has attracted the most attention is the caecilian seen in this photo. Caecilians are a group of amphibians that has invaded the underground environment, so that their bodies are elongated, they have no limbs and their eyes are vestigial – all characteristics that allow them to squirm through their subterranean tunnels. Because of their penchant for the underground, these animals are rarely seen, and therefore, little is known about them. 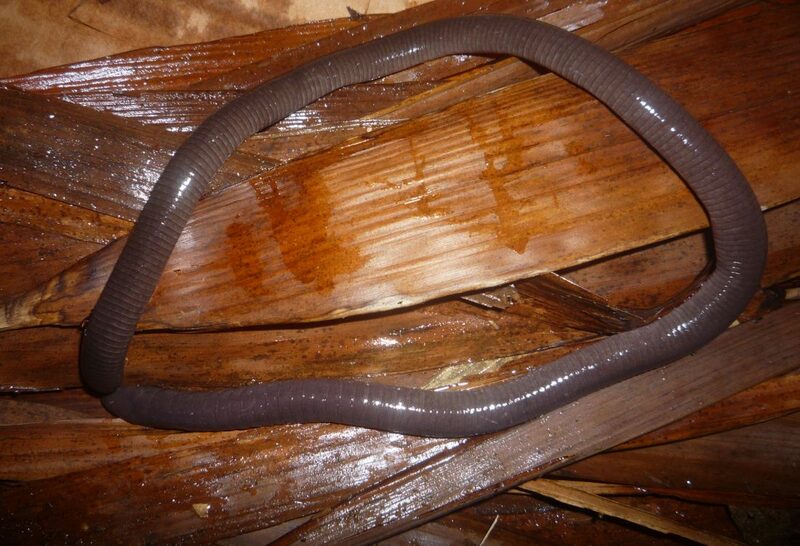 According to the latest review of this group in the Osa Peninsula, there are three species of caecilians, one of these endemic (Oscaecilia osae), which has been reported only twice in Corcovado National Park. The species that we have been observing, Dermophis occidentali, has been found at both the Piro Research Center, and the Greg Gund Conservation Center (GGCC). The individual in the photo was found at the GGCC by Kory Kramer, in one of the buildings. This was in early July, when the onset of the rains saturates the ground forcing caecilians to surface. If you’re lucky, you’ll see one. On this occasion, all Friends of the Osa staff were gathered for an activity so that everyone had the opportunity to observe this rare species.